Col. Harrison Hobart is best-remembered as a Democratic Party politician before and after the Civil War, and for organizing a daring escape of 100 Union prisoners from Libby Prison in Virginia. He also led his troops at the Battle of Atlanta and on Sherman's 1864 March to the Sea. Hobart was a printer's apprentice before attending Dartmouth College, where he graduated in 1842. He studied law in Boston, was admitted to the Massachusetts bar in 1845, and settled in Sheboygan, Wisconsin, the following year. He became a successful attorney and a Democratic member of the state legislature, 1847-1849. He moved to Chilton, Wisconsin, in 1854 and represented that district in the state Assembly (1859) while continuing to practice law. Hobart enlisted just two weeks after the outbreak of war in April 1861, raising a company from the vicinity of Chilton who elected him captain. Over the next year he led Co. K of the 4th Wisconsin Infantry in the defense of Washington, D.C., the capture of New Orleans and Baton Rouge, and an unsuccessful assault on Vicksburg, Mississippi. 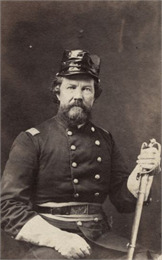 In the summer of 1862, Hobart accepted a promotion to lieutenant colonel of the 21st Wisconsin Infantry, which he joined in Kentucky just after the Battle of Perryville in October. The regiment's colonel had been badly wounded and Hobart immediately assumed command. He led it in the Battle of Stone River, and subsequent engagements in Tennessee. In September 1863, at the Battle of Chickamauga, Hobart and about 70 of his men were captured. They were confined at Libby Prison in Richmond, Virginia, for four months. Hobart organized an effort to dig a secret tunnel through which 109 men escaped in February 1864. After rejoining his regiment, Hobart led it through the Atlanta Campaign and was promoted to colonel on November 1, 1864. He commanded a brigade during Sherman's March to the Sea, after which President Lincoln brevetted him a brigadier general. Hobart mustered out on June 8, 1865. Hobart resumed his law practice in Milwaukee and in the fall of 1865 was the unsuccessful Democratic candidate for governor. He served again in the state Assembly in 1867, and was a regent of the University of Wisconsin (1860-1865, 1867-1869). For a time, Hobart operated a law office in Washington, D.C., but retained his Milwaukee residence. He died there on January 26, 1902.